I’d categorize Mr. J as a sauce person whereas my sauces don’t always come out perfectly. I think they are coming along. I made a lot of sauce even when making chicken-for-two. This was a FLAVORFUL meal. This was a pretty quick meal to put together and I loved the vinegar flavor. It felt different and made me want to use balsamic vinegar more often. 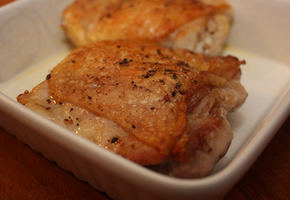 Heat the olive oil and cook chicken thighs until a medium golden brown, about 5 minutes. Flip the chicken over and cook for about 3 minutes. Put chicken into the oven and bake for 10 minutes. 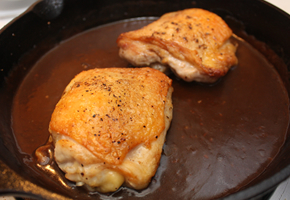 Add garlic to the chicken pan (careful: don’t let it burn). Stir in balsamic vinegar and chicken broth over a low boil. Whisk in mixed flour and butter to thicken sauce, cooking for about 2 more minutes over low. Add in chicken and coat in sauce and cook for 5 minutes. I liked the balsamic flavor but also think I put in too much (I used about ⅓ cup) so I’d recommend a quantity of a few tablespoons.I eat a solid amount of chicken but I don’t use chicken thighs very often. They were a great change. A little dark meat here and there never hurts. 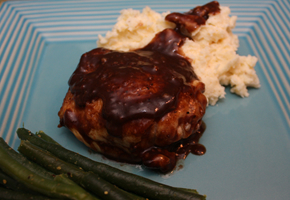 I served this with mashed potatoes (with a touch of sour cream) and steamed green beans. It was a really comforting meal. That looks absolutely amiazng! I love recipes that mix fruit with something unexpected like balsamic vinegar. My husband would not let me prepare any recipe that had add combinations so my task is now to prove that I am not the only person who would make a recipe that includes fruit, balasamic vinegar and maybe even black peppar . I looooove japanese food and will visit your blog soon again!!! my mom is japanese so I have some ideas of how to cook some dishes!!! Thanks!Mami recently posted..